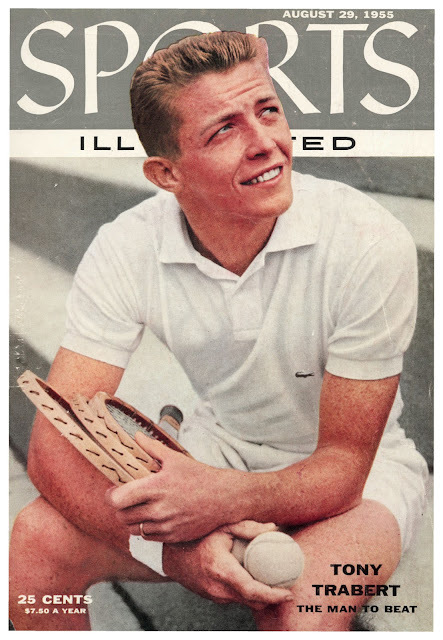 Aug. 29, 1955: Tony Trabert won the French, Wimbledon and U.S. Open in 1955 and made the semifinals at the Australian Open -- his Grand Slam was thwarted by Aussie Ken Rosewall. 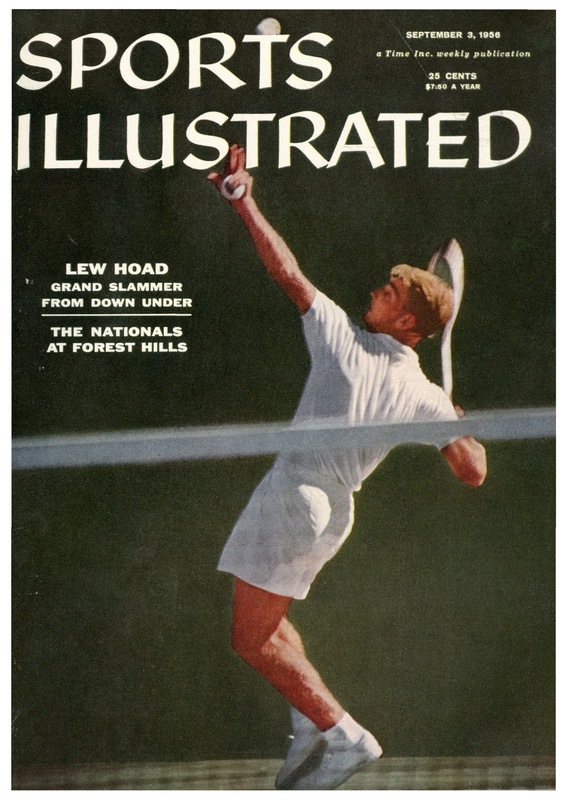 Sept. 3, 1956: Lew Hoad also narrowly missed a Grand Slam, winning the French, Wimbledon and Australian in 1956 and losing the final at the U.S. Championships. 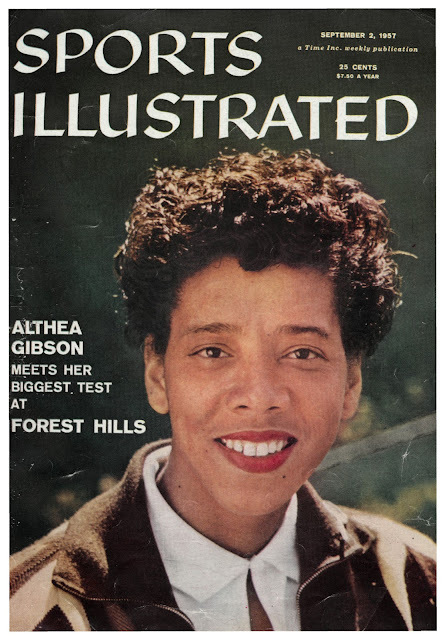 Sept. 2, 1957: Althea Gibson won Wimbledon and U.S. in 1957 and 1958. 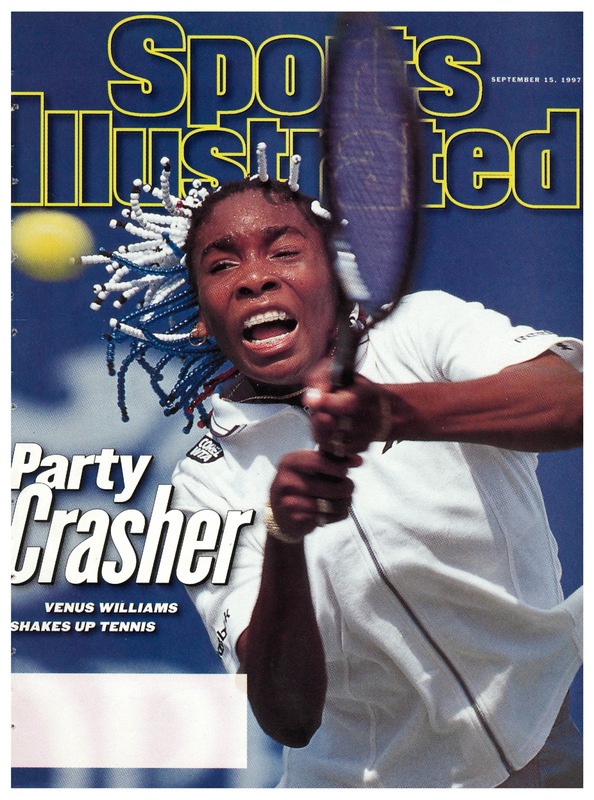 But when Venus Williams matched the feat in 2000-2001, she didn't get a single cover. 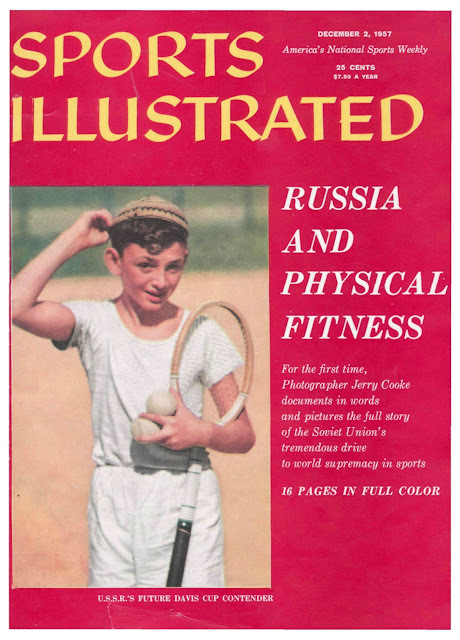 Dec. 2, 1957: It would be nearly 20 years before Olga Morozova would reach the finals at the French and Wimbledon, but clearly the magazine saw what was coming. 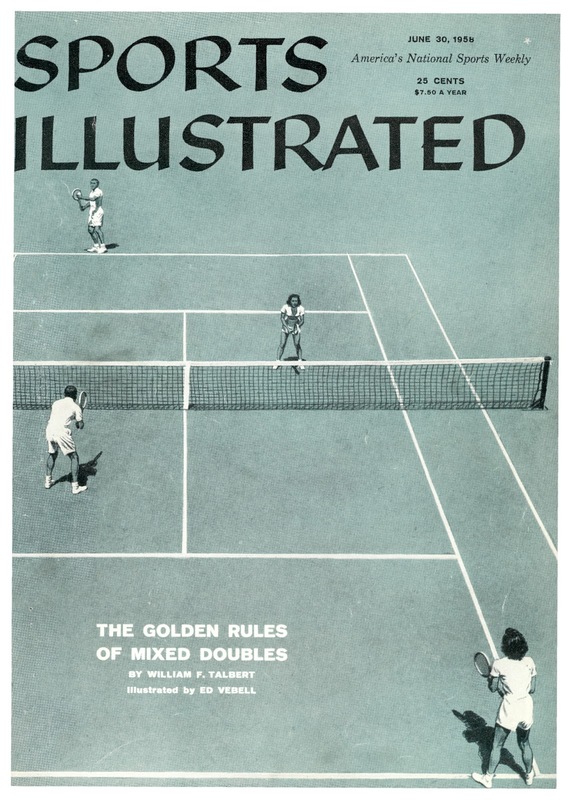 June 15, 1958: That year, Gonzales and Hoad played each other 87 times. 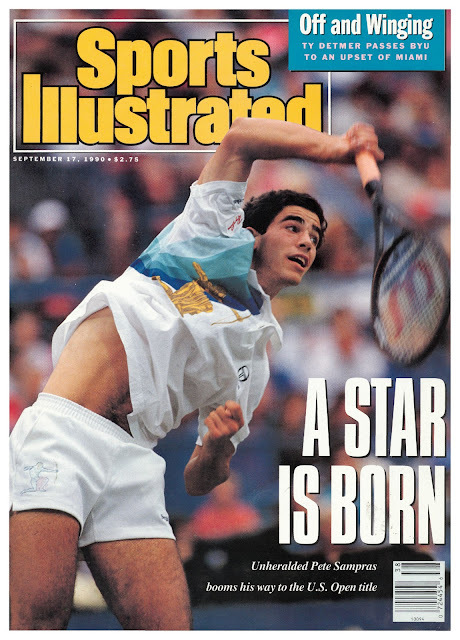 (For context, Roger Federer and Rafael Nadal have played each other 37 times in their entire careers!) 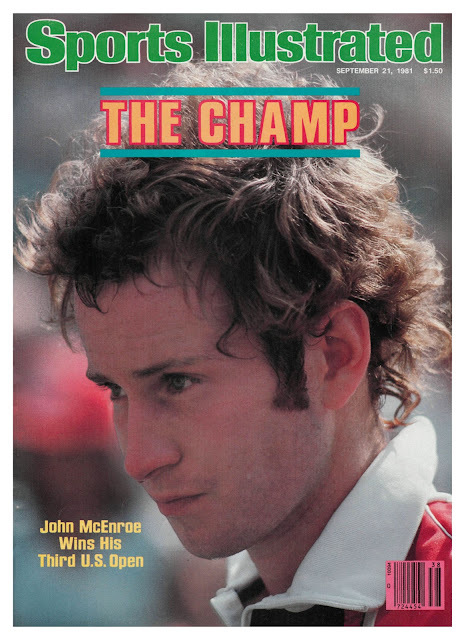 Hoad won 18 of the first 27 matches and it appeared that he was about to displace Gonzales as the best in the world. 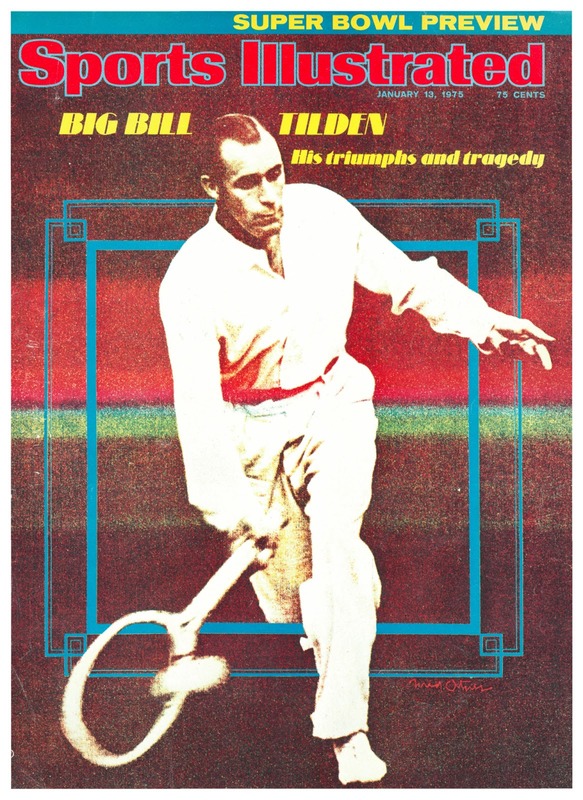 Gonzales, however, revamped and improved his backhand during the course of those first matches -- just as Bill Tilden had to do in 1920 in order to get the better of his rival Bill Johnston and as we've seen with Federer in 2017 -- and become the best in the world. 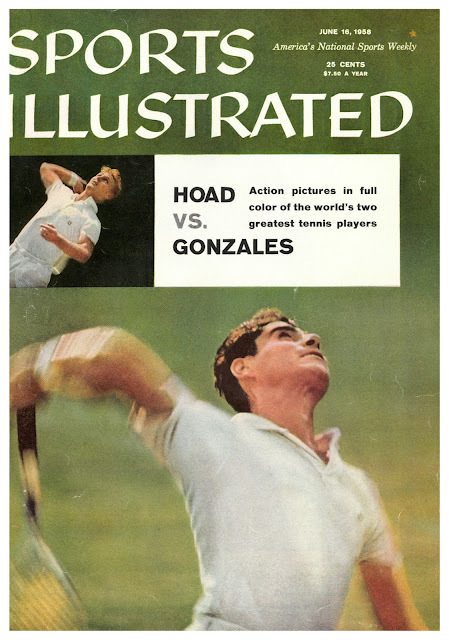 Gonzales then won 42 of the next 60 matches against Hoad and maintained his superiority by a margin of 51 wins to 36 wins for Hoad. 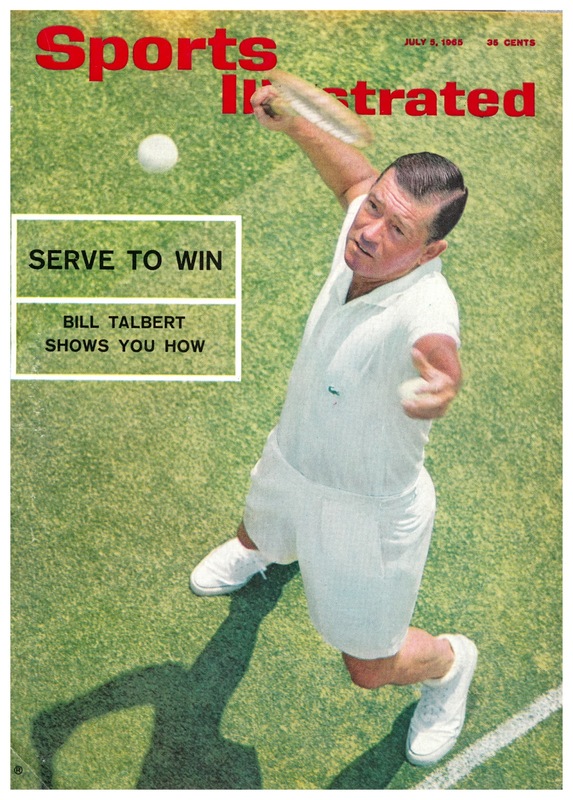 June 30, 1958: Former player Bill Talbert penned "The Golden Rules of Mixed Doubles," one of several instructional pieces to grace the cover. 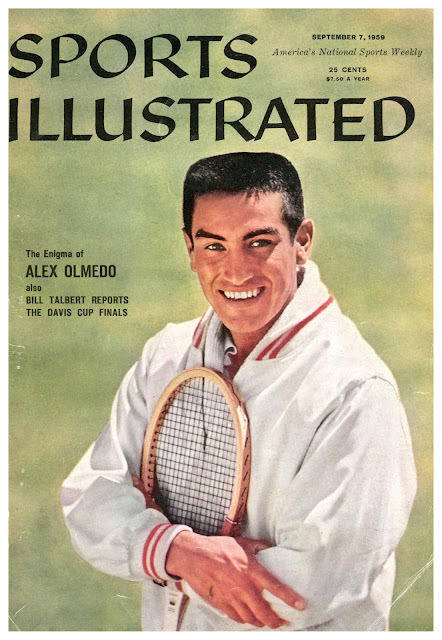 Sept. 7, 1959: Peruvian-born Alex Olmedo won Wimbledon and Australian that year, and was runner-up at the U.S. Championships. Sept. 4, 1961: Strategies at Forest Hills worked well for Australian Roy Emerson and American Darlene Hard, who took home the crowns. 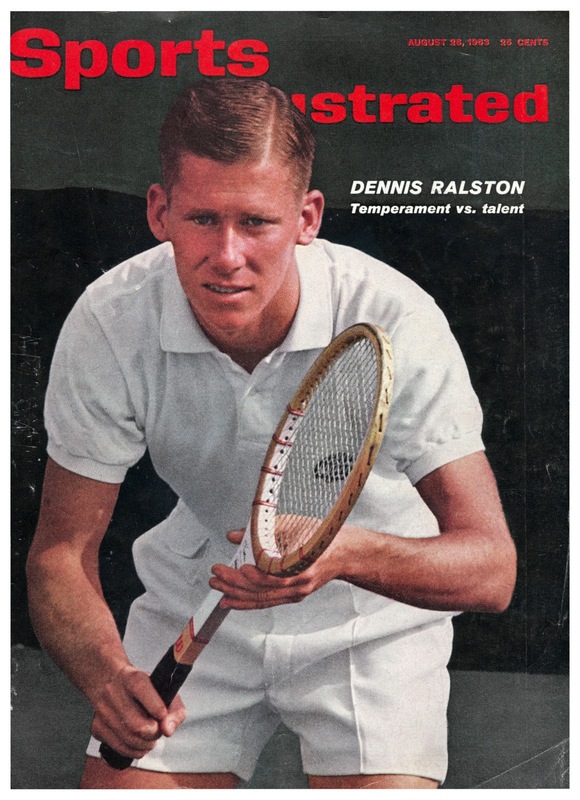 Aug. 26, 1963: Dennis Ralston was a member of the "Handsome Eight," the initial group of players signed to the professional World Championship Tennis tour. His looks overshadowed his play, however, as he only reached on major final (Wimbledon 1966). 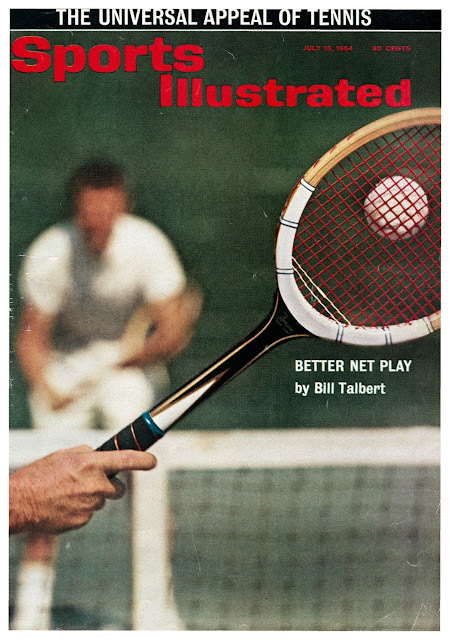 July 13, 1964: Bill Talbert got another cover, this time on better net play. Aug. 29, 1966: Rising star Arthur Ashe reached the final of the Australian Championships in 1966 (and 1967), losing to Roy Emerson on both occasions. 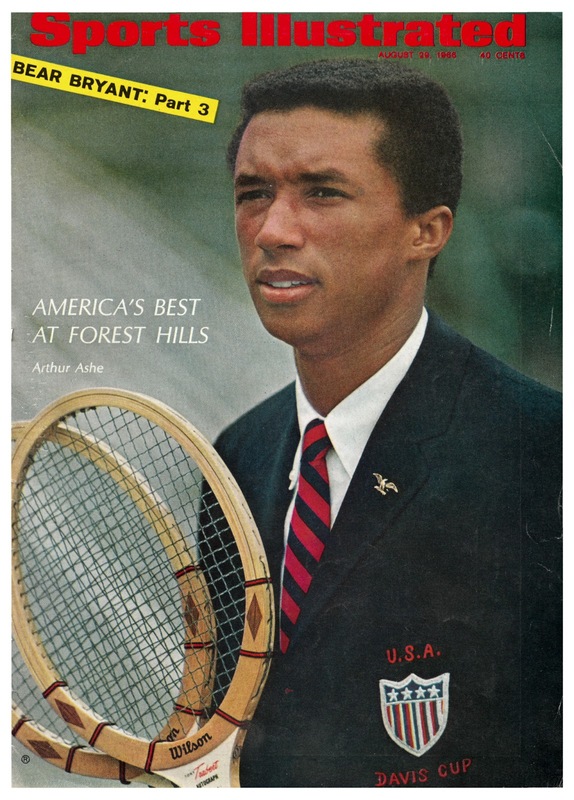 He also graduated in 1966 with a bachelor's degree in business administration from UCLA, where he was on a tennis scholarship, then joined the U.S. Army on Aug. 4, 1966. He was promoted to first lieutenant in 1968 and was discharged in 1969. 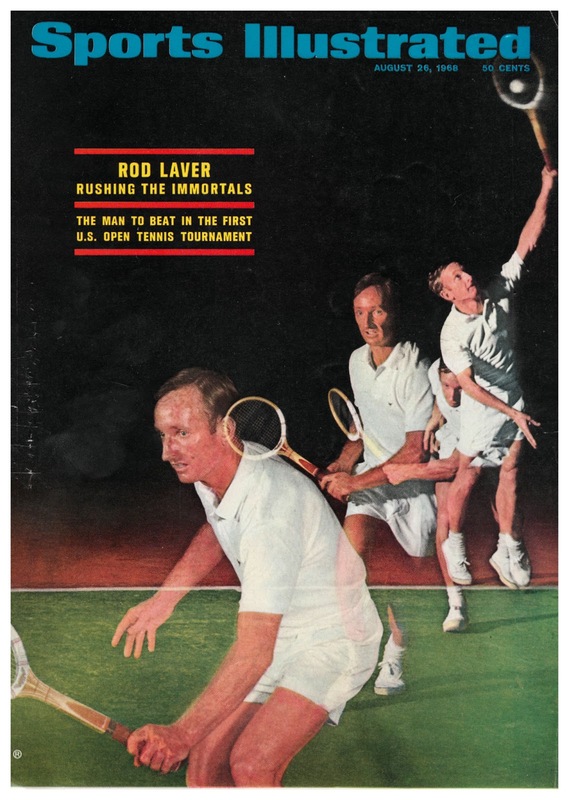 Aug. 26, 1968: Rod Laver was indeed the man to beat at the first open U.S. Championships. 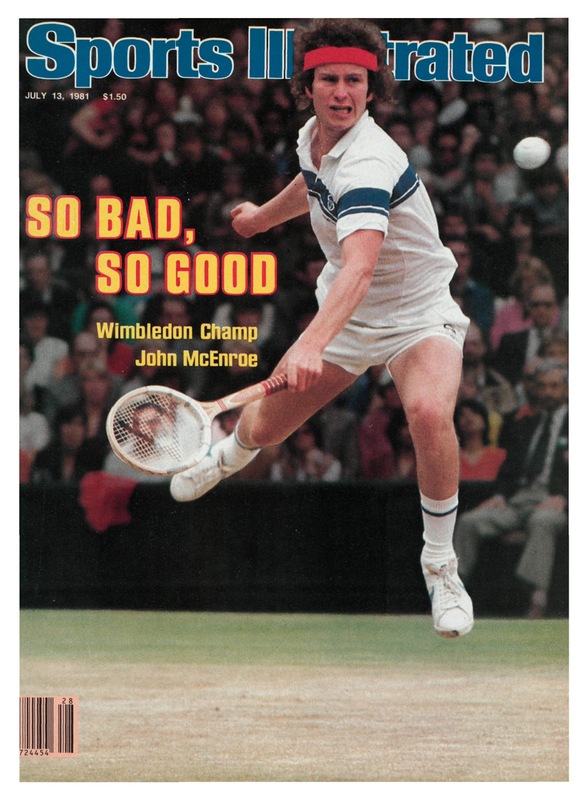 But the top seed lost in the Round of 16 to South African Cliff Drysdale, going home with just a Wimbledon title that year. 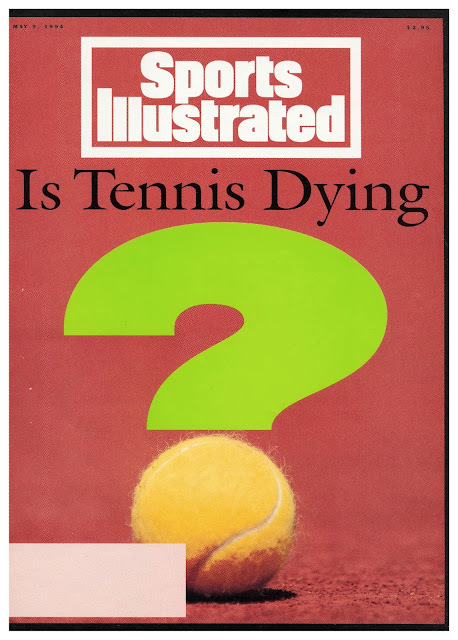 Not to fear, though. 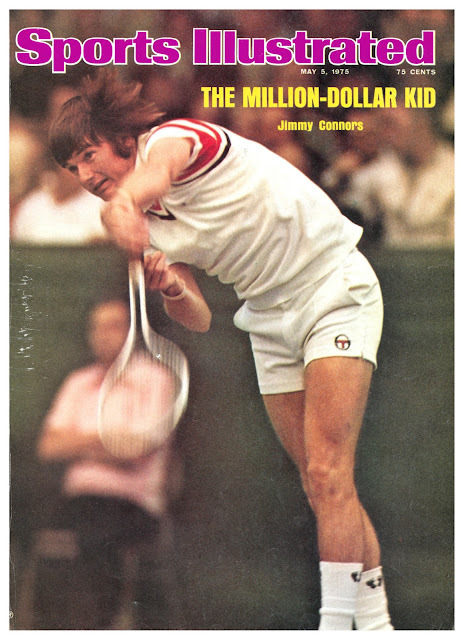 He would return in 1969 and go on to win the Grand Slam -- again! July 12, 1971: The New Champion From the Outback won the French and Wimbledon that year. 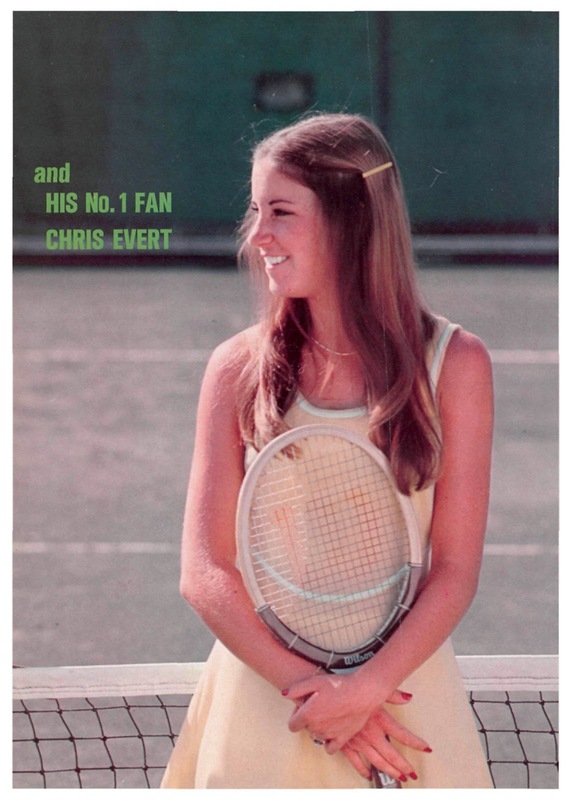 She'd come back to the All England Club in 1980 and win it again, this time as a mother. 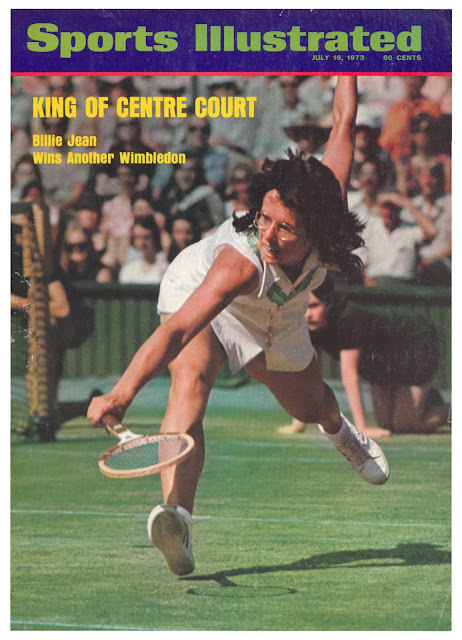 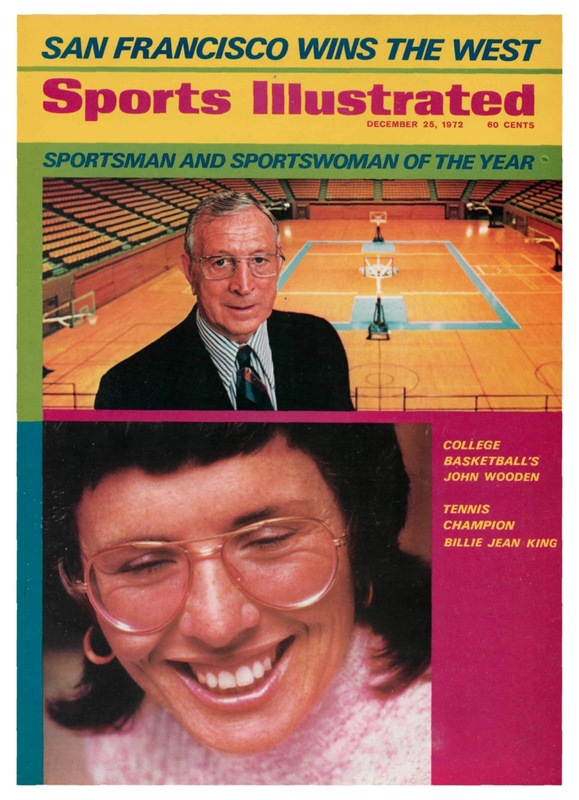 Dec. 25, 1972: Despite having won nine Grand Slam singles titles by this point -- including the French and Wimbledon that year -- this was BJK's first cover appearance ... and she had to share it with the sportsman of the year! 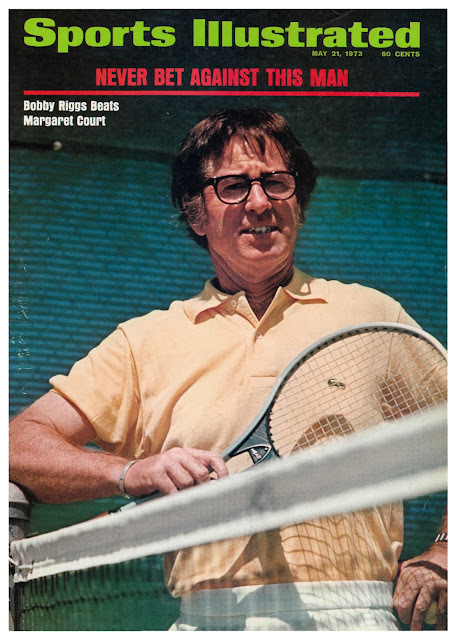 May 21, 1973: Bobby Riggs got the royal treatment for his "Mother's Day Massacre" of Margaret Court, who won three of the four majors that year. as well as Chris Evert's heart. 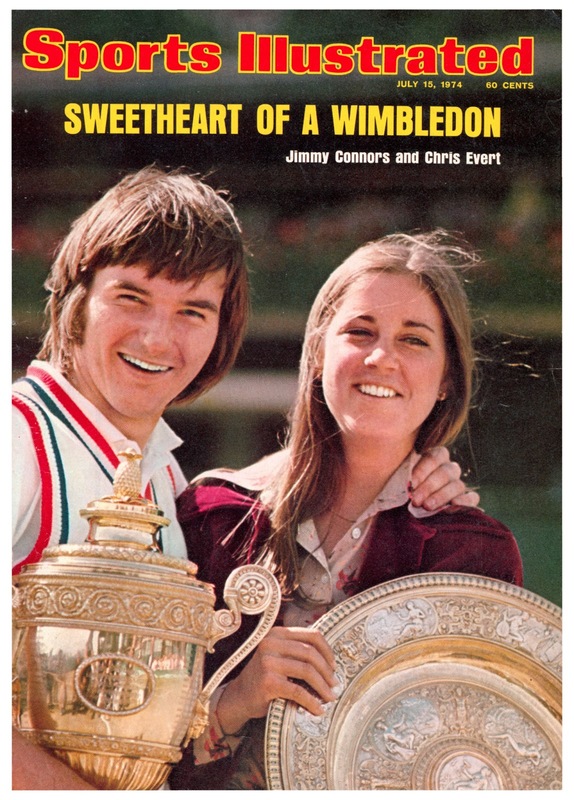 July 15, 1974: Love birds Jimmy and Chrissie both won Wimbledon in 1974 -- but tweeting this cover at Mrs. Evert Lloyd Mill Norman led her to block me! 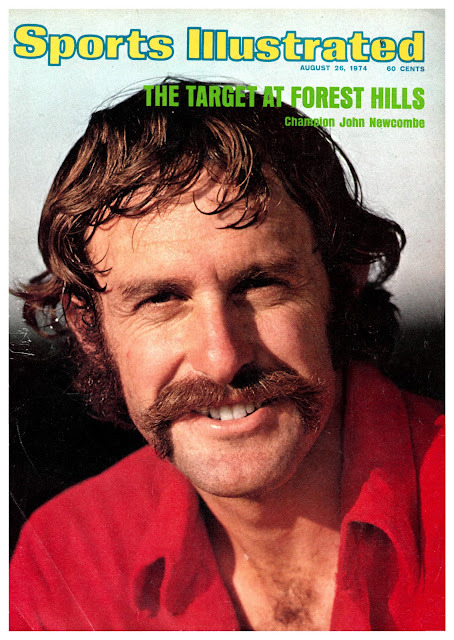 Aug. 26, 1974: John Newcombe wasn't able to defend his title that year -- he lost to Ken Rosewall in the semifinals -- but at age 30, he never looked more handsome. Jan. 13, 1975: Not sure how much of Bill Tilden's penchant for teenage boys made it into this cover story about the seven-time U.S. and three-time Wimbledon champion. 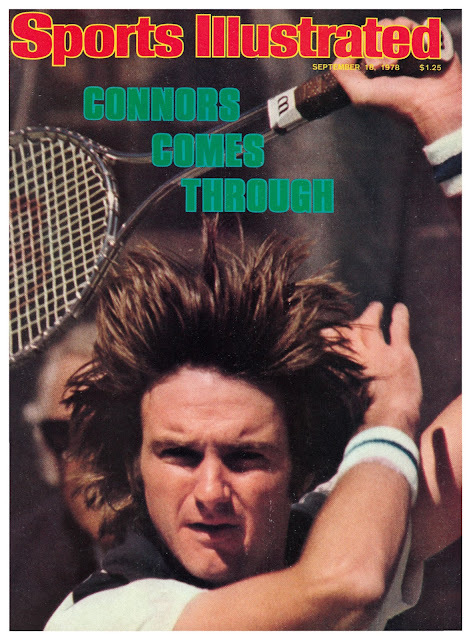 May 5, 1975: The noisome ballyhoo behind them, Jimmy Connors and John Newcombe got down to trading whacks at Las Vegas. Three hours later Connors strode off the court still No. 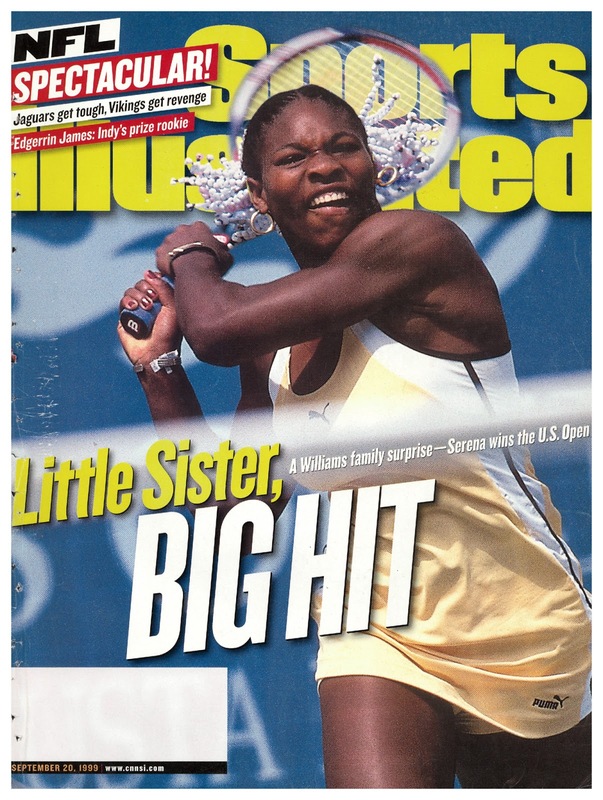 1 and $500,000 richer. 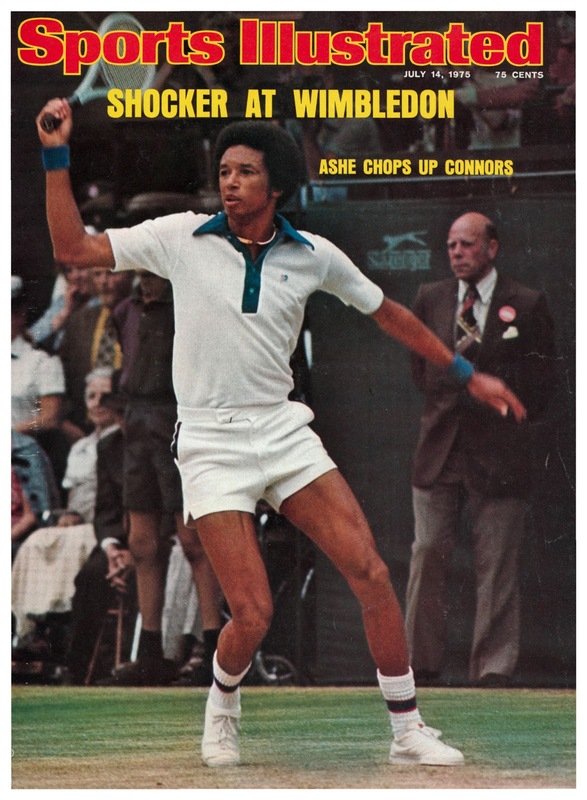 July 14, 1975: Arthur Ashe stuns Jimmy Connors -- and the world -- in the Wimbledon final. 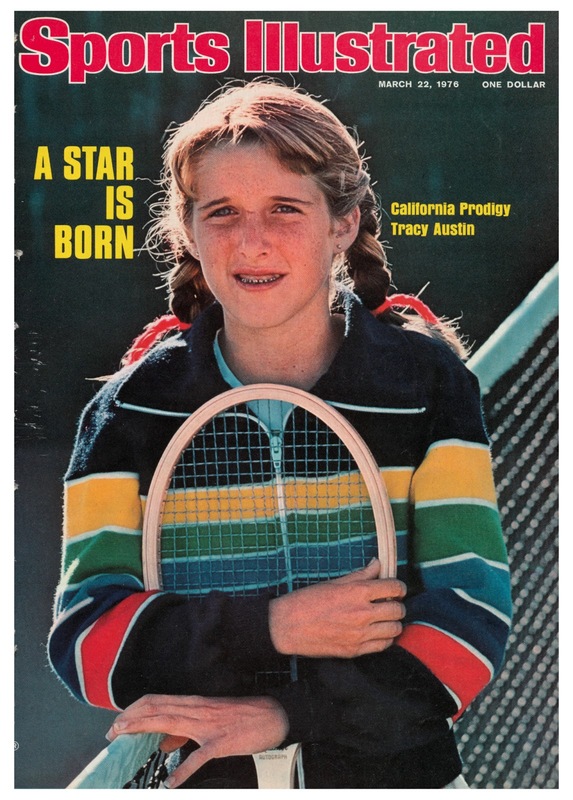 March 22, 1976: Tracy Austin is declared a star at age 13. 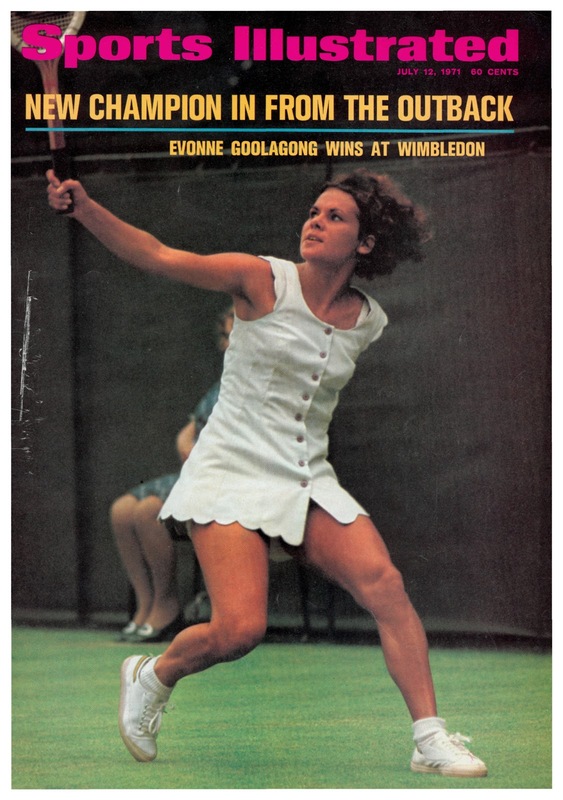 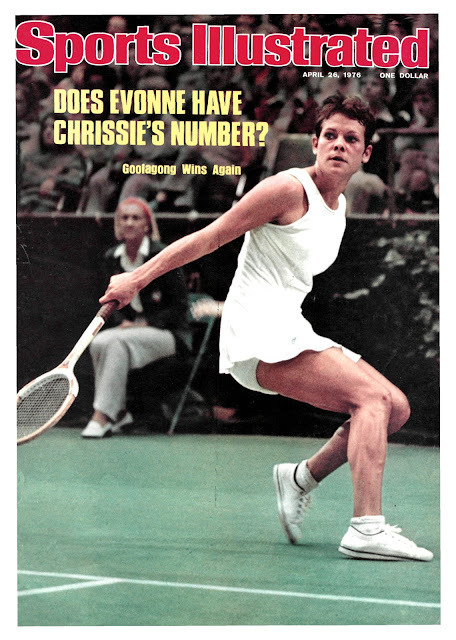 April 26, 1976: A thrilling account of the winter-ending Virginia Slims Champions, in which Evonne Goolagong defeated Chris Evert 6-3, 5-7, 6-3 in the final. 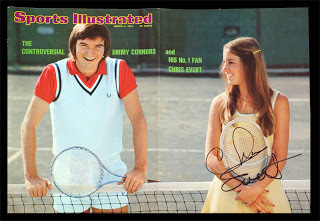 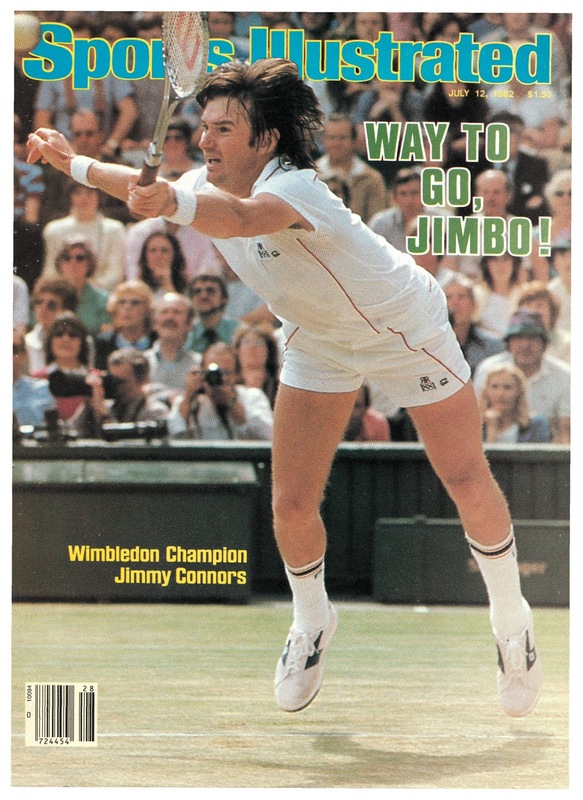 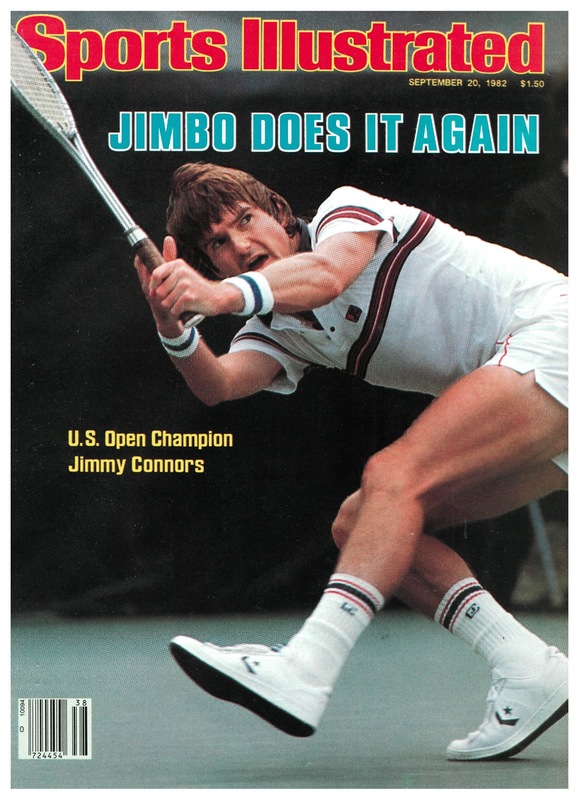 Sept. 20, 1976: Jimmy Connors wins his second of five U.S. Open titles, with a four-set victory over Bjorn Borg. 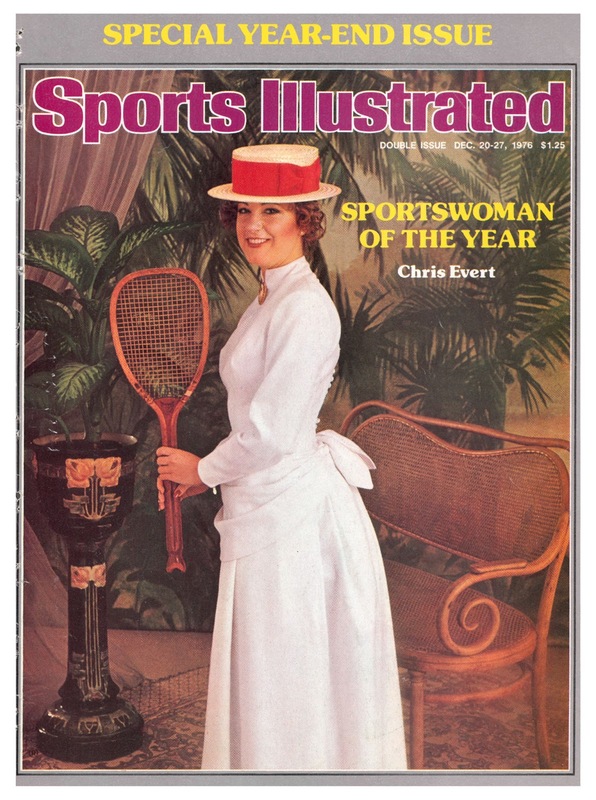 Dec. 20-27, 1976: Chris Evert -- winner of Wimbledon and the U.S. Open-- is named Sportswoman of the Year. 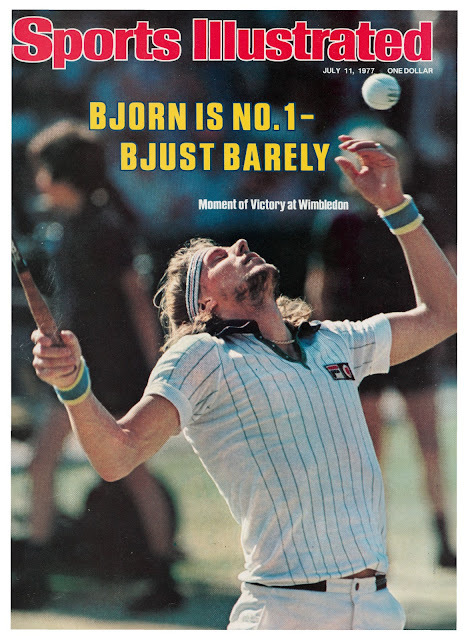 July 11: 1977: Bjorn Borg is No 1 -- Bjust Barely. 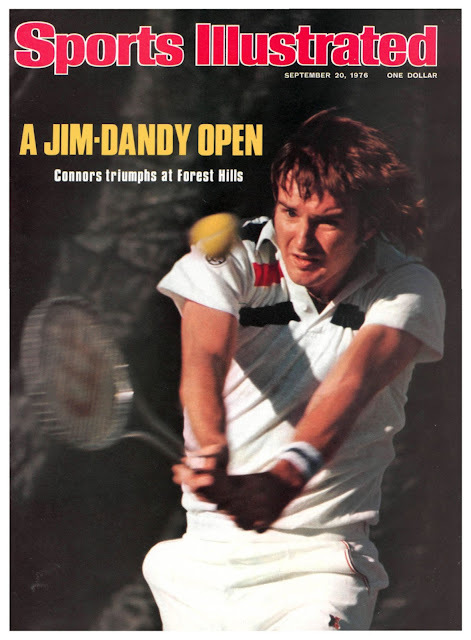 Sept. 18, 1978: Connors comes through in Flushing Meadows, making him the only player to win the title on three surfaces. Dec. 18, 1978: John McEnroe created a splash making the semifinals at the 1977 Wiimbedon and 1978 U.S. Open. 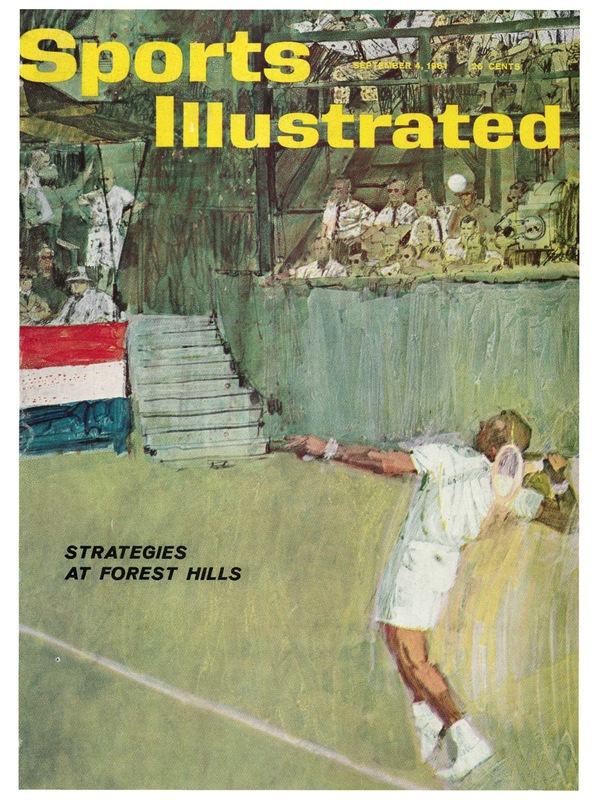 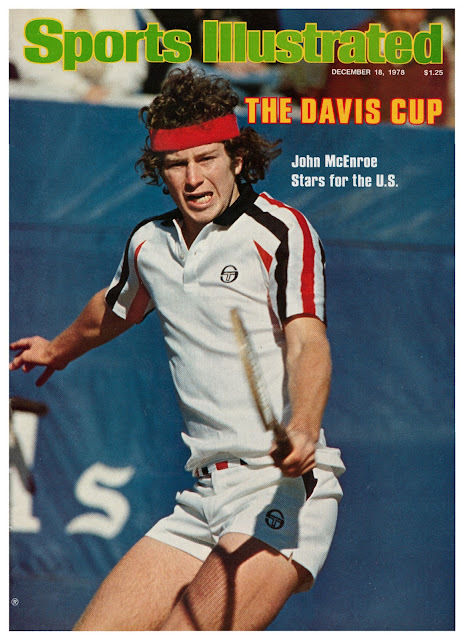 But his first cover was focus on the Davis Cup, where he led the U.S. to victory in 1978, then again in 1979, 1981, 1982. July 16, 1979: Borg wins his fourth Wimbledon and SI can't get enough. Sept. 17, 1979: Tracy Austin makes good on the magazine's promise, becoming the youngest player to ever win the U.S. Open. 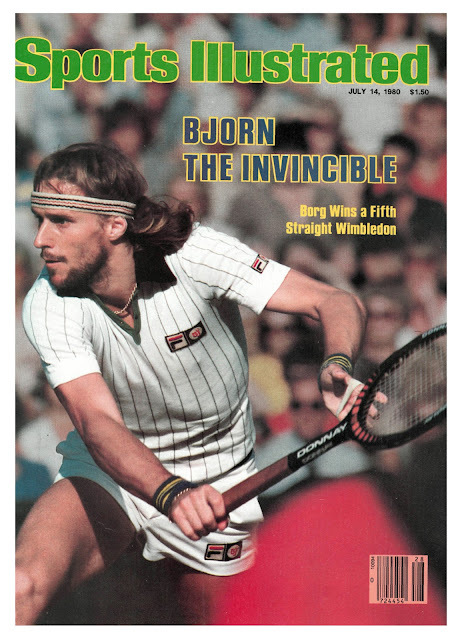 July 14, 1980: Bjorn the invincible wins his fifth straight Wimbledon. 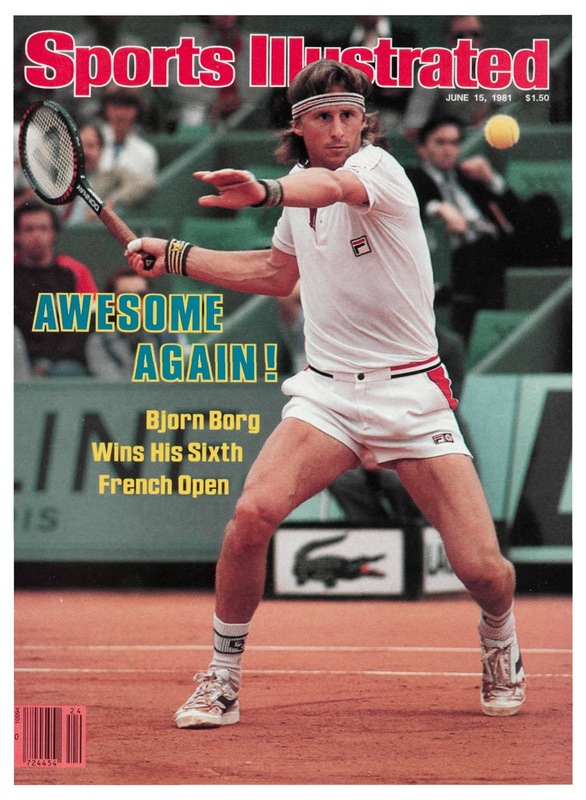 July 15, 1981: Bjorn Borg wins his sixth French Open. 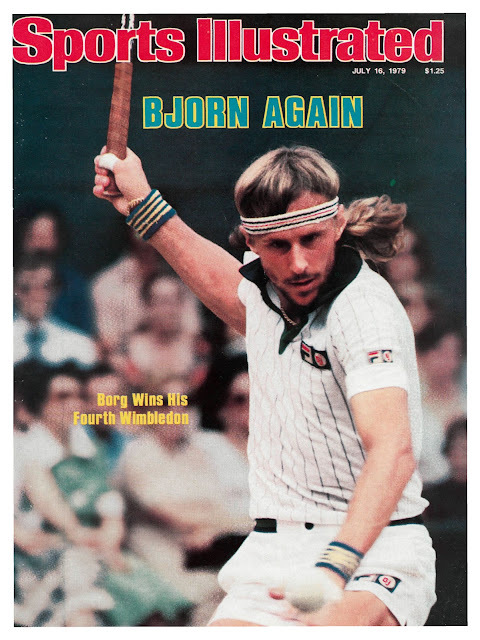 July 13, 1981: John McEnroe ends Bjorn Borg's reign at Wimbledon, beating the Swede in four sets. 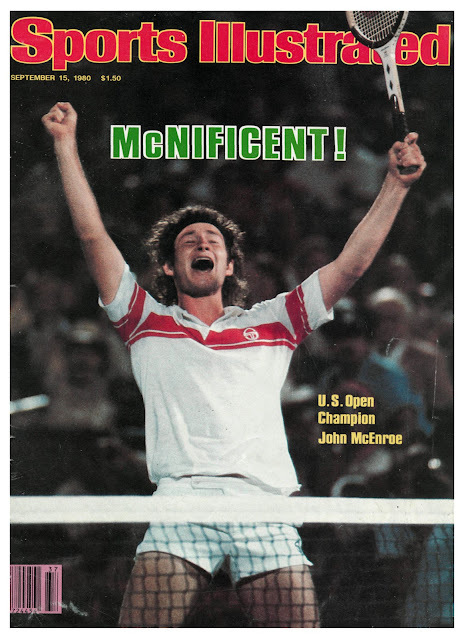 Sept 21, 1981: John McEnroe wins his third U.S. Open, beating Bjorn Borg in four sets and driving him into early retirement. 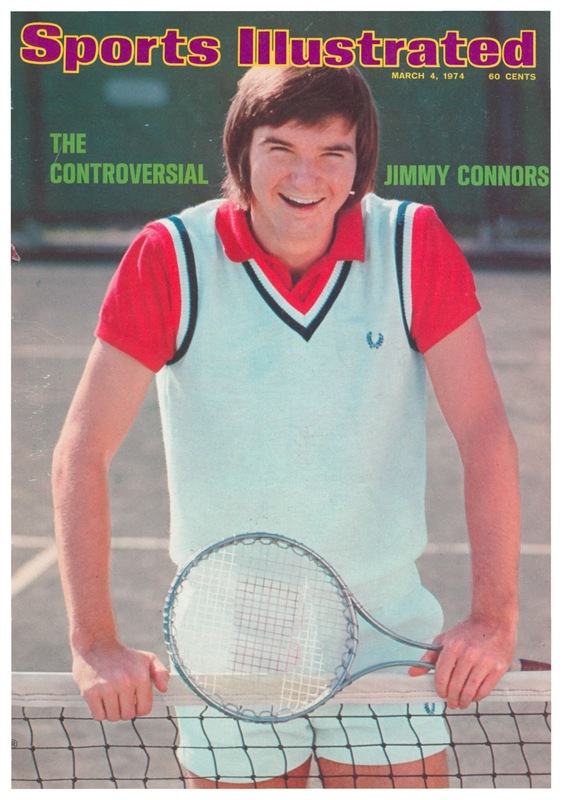 July 12: 1982: Jimmy Connors defeats defending champion John McEnroe in the Battle of the Ugly Americans, 3–6, 6–3, 6–7, 7–6, 6–4. Ivan Lendl sits this one out, citing his inability to play on grass. Meanwhile, Guillermo Vilas and José Luis Clerc refuse to play in protest over the Falklands Crisis. Sept. 20, 1982: Jimmy Connors does it again, winning the U.S. Open over Ivan Lendl, who had upset defending champion John McEnroe in the semifinals. 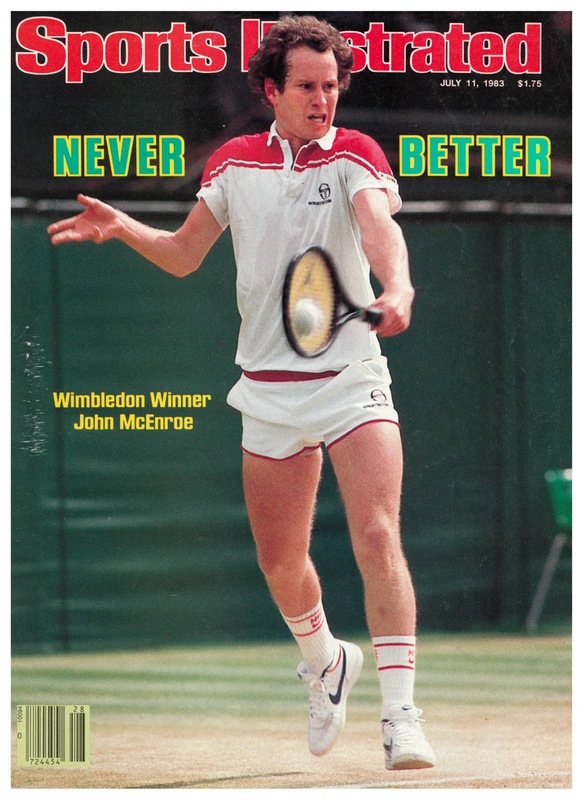 July 11, 1983: John McEnroe beats surprise finalist Chris Lewis of New Zealand to win his second Wimbledon crown. Sept. 19, 1983: Martina Navratilova had already won four Wimbeldons before she finally made the cover, for winning his first U.S. Open. 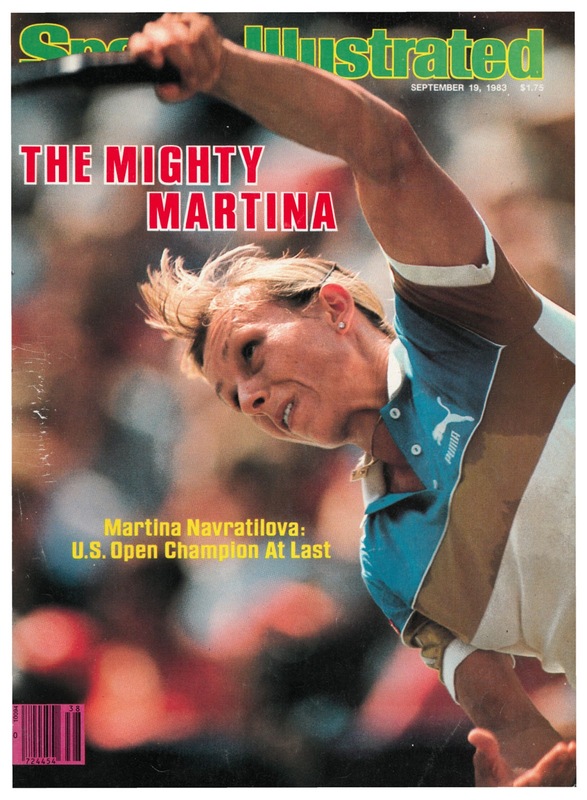 June 18, 1984: Martina Navratilova became on the second woman in open era to hold all four majors when she embarrassed Chris Evert in the final of the French Open, 6-3, 6-1. 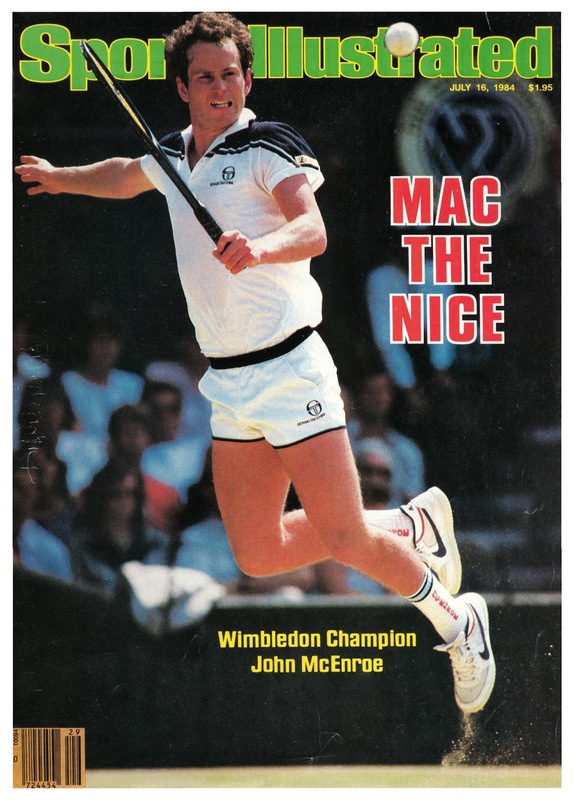 July 16, 1984: John McEnroe wins his third and final Wimbledon with a straight-set drubbing of Jimmy Connors. 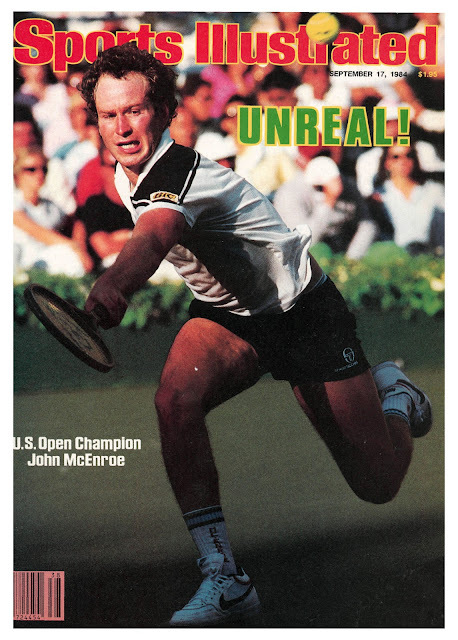 Sept. 17, 1984: John McEnroe wins his fourth and final U.S. Open with a straight-set drubbing of Ivan Lendl. 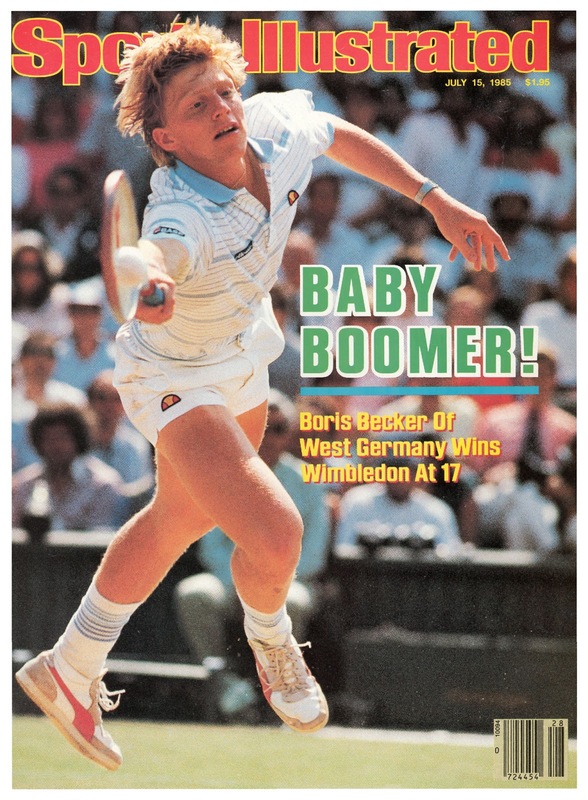 July 15, 1985: I graduated from high school the summer Boris Becker came out of nowhere to win Wimbledon at age 17, his first of six major titles. 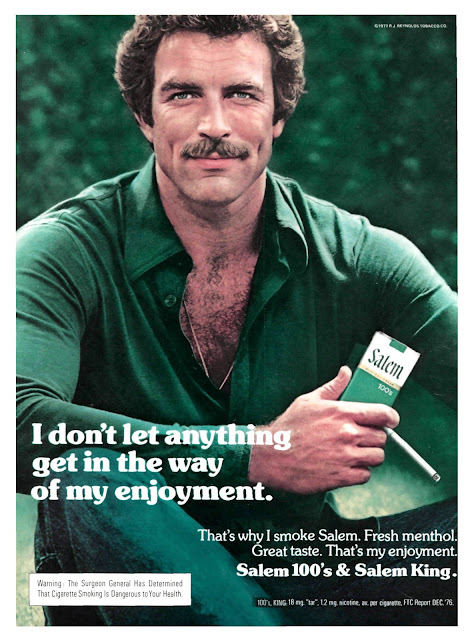 I'd never thought much of gingers -- but I suppose I was looking a lot lower. 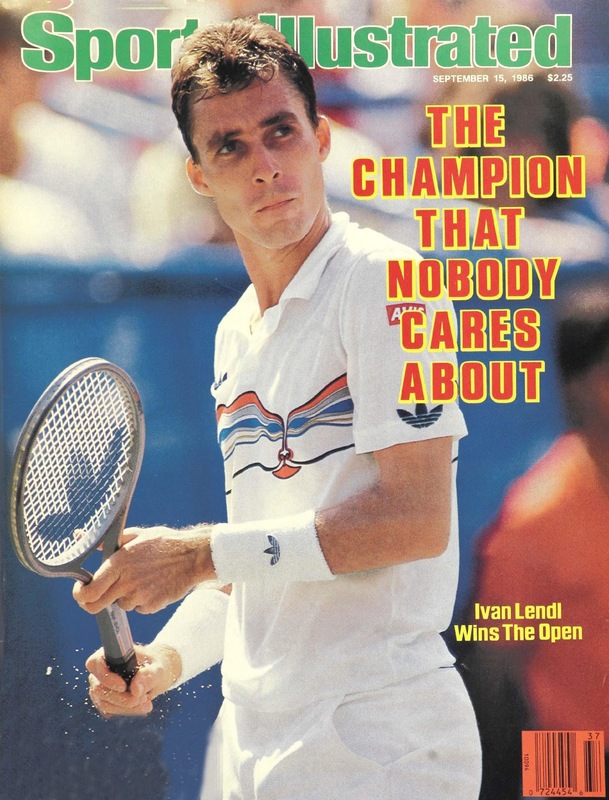 Sept 15, 1986: Ivan Lendl, who nobody cares about, wins the U.S. Open again. Sept. 19, 1988: Steffi Graf makes history at the U.S. Open completing the Grand Slam. 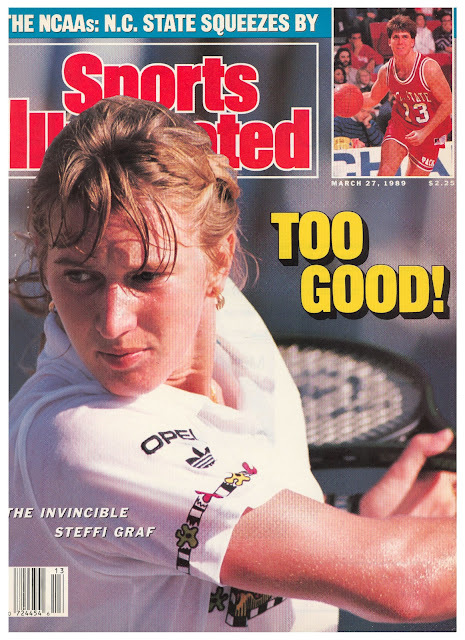 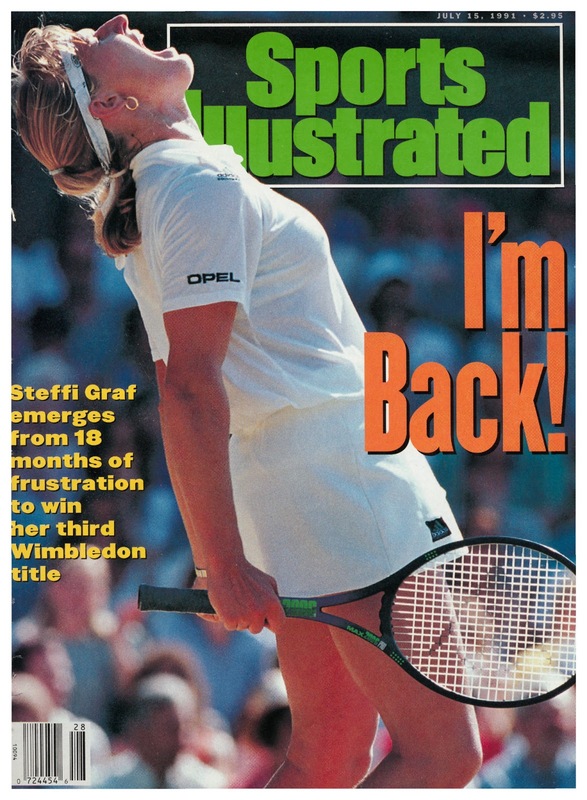 March 29, 1989: The Invincible Steffi Graf. 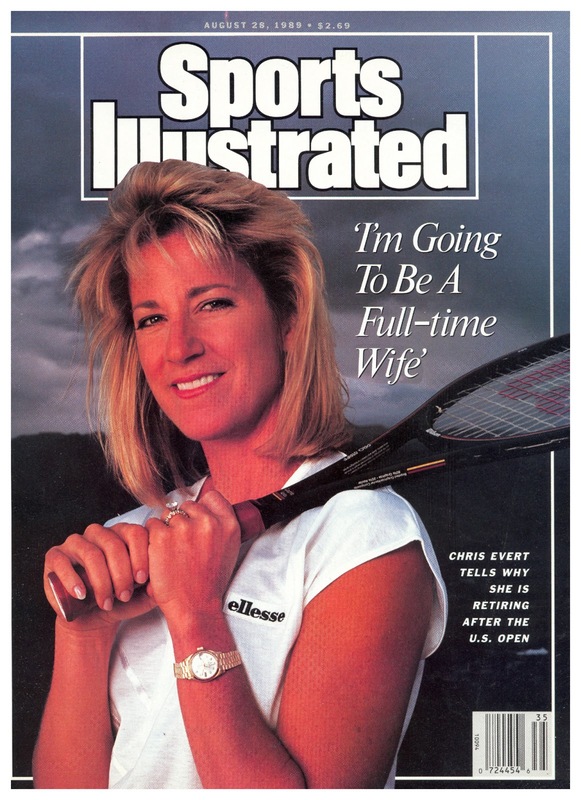 Aug. 28, 1989: Chris Evert tells why she is retiring after the U.S. Open. 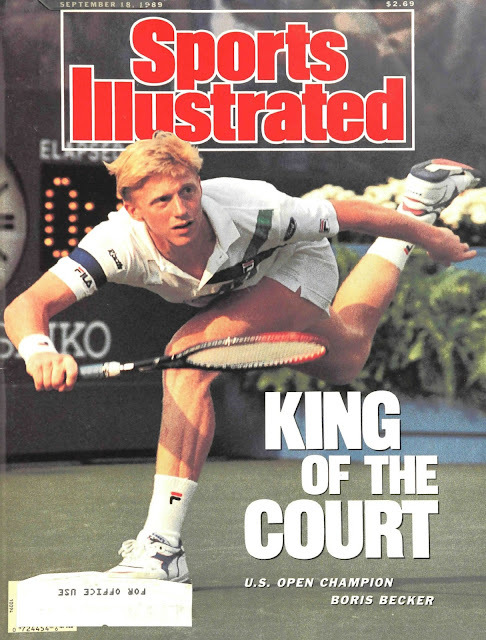 Sept. 18, 1989: U.S. Open Champion Boris Becker is King of the Court. 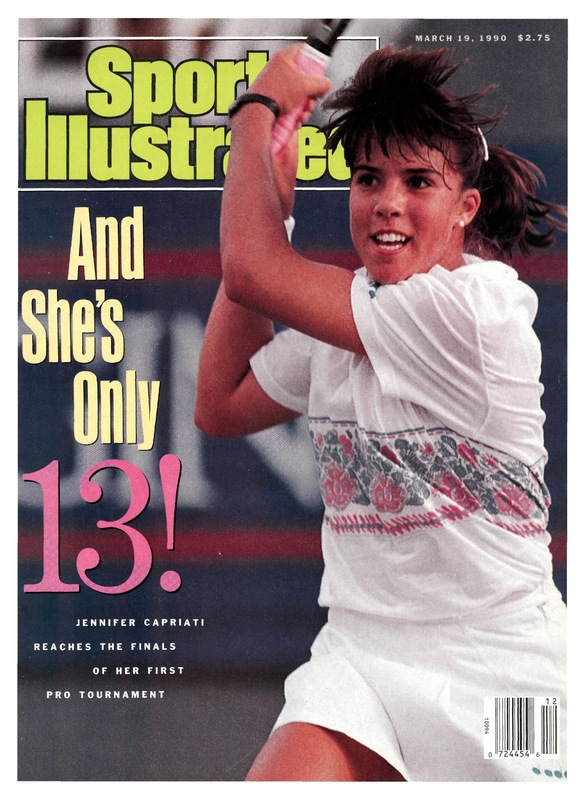 March 19, 1990: Jennifer Capriati reaches the final of her first pro tournament -- and she's only 13! 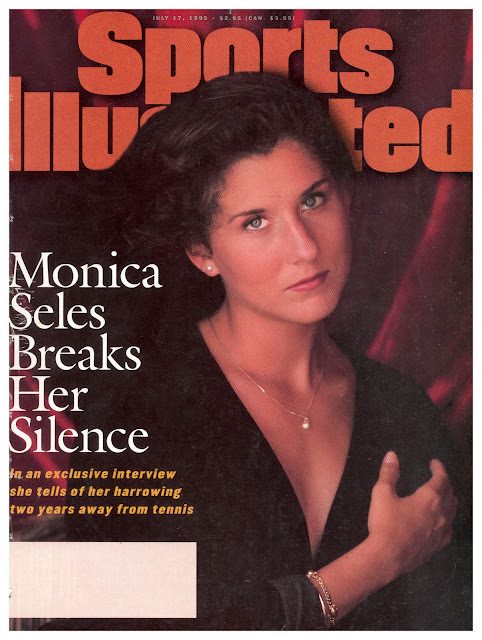 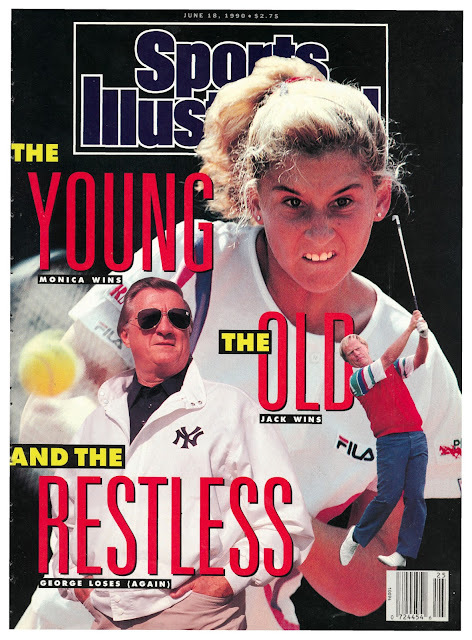 June 18, 1990: Monica Seles, who might have been the best player to ever play the game, appeared on just one cover prior to her assault -- and two after. 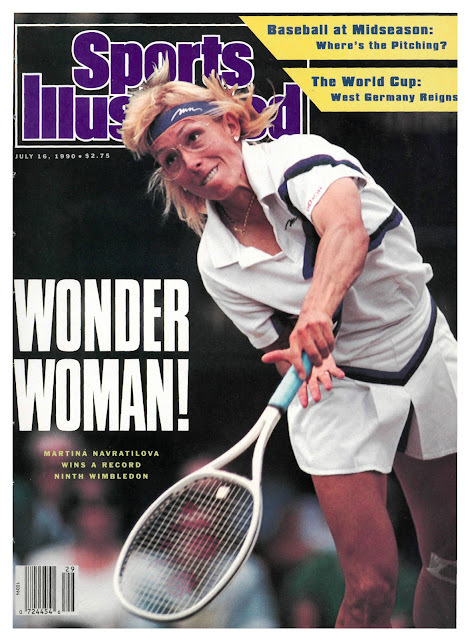 July 16, 1990: Martina Navratilova wins her record ninth Wimbledon singles crown. 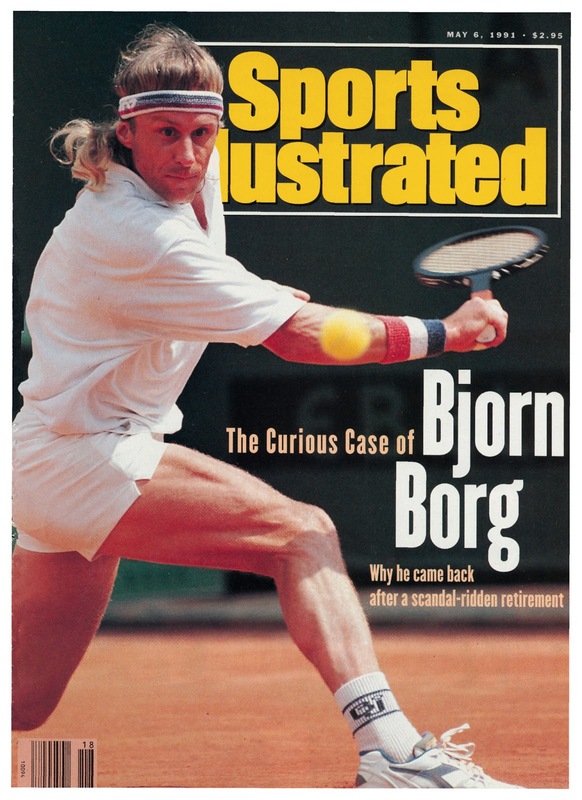 May 6, 1991: After myriad personal problems, Bjorn Borg makes a sad return to tennis. 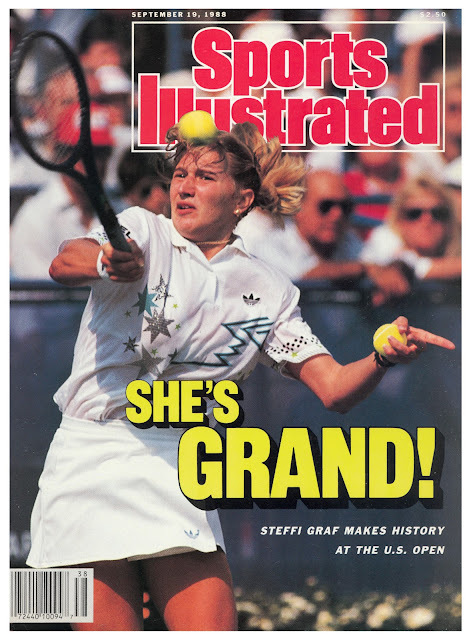 July 15, 1991: Steffi Graf emerges from 18 months of frustration to win her third Wimbledon title, narrowly defeating Gabriela Sabatini in three sets. 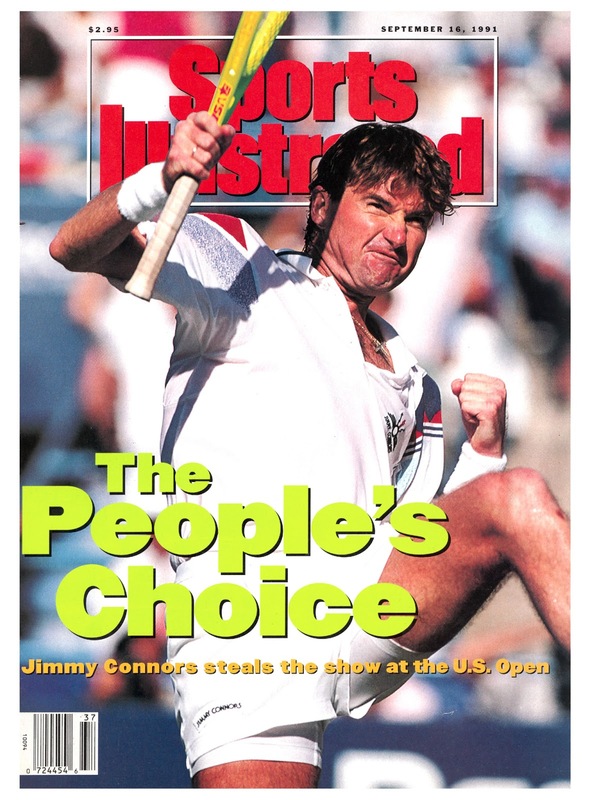 Sept. 16, 1991: Jimmy Connors steals the show at the U.S. Open. 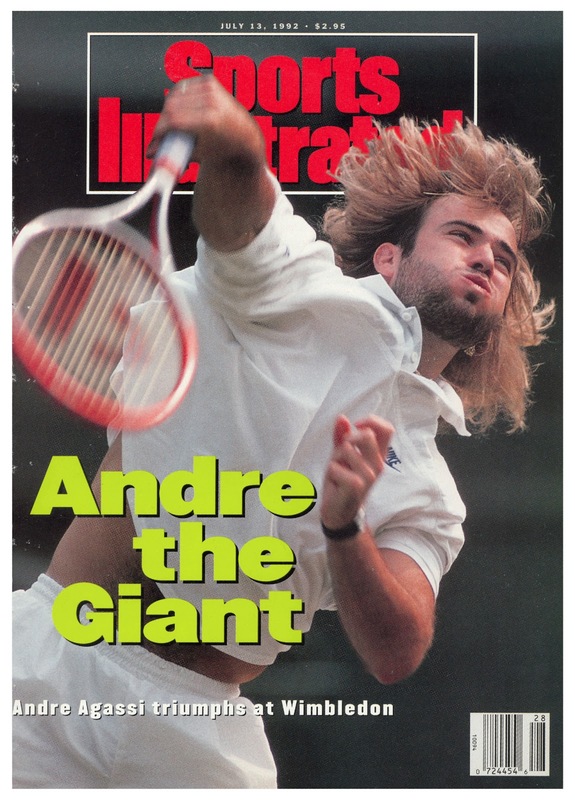 July 13, 1992: Andre Agassi finally found someone who would choke even more than he does to win at Wimbledon. 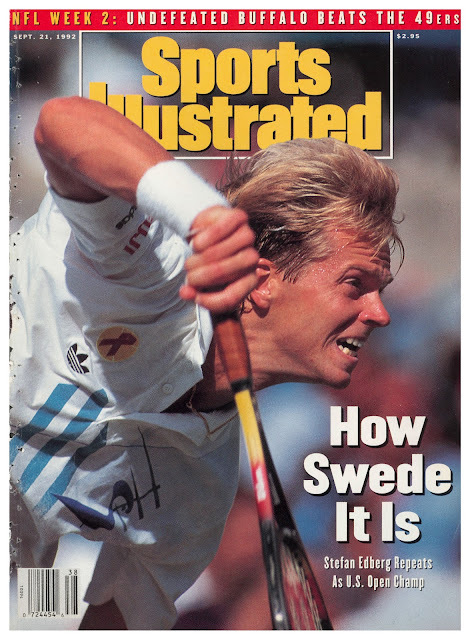 Sept. 21, 1992: Stefan Edberg repeats as U.S. Open champ. 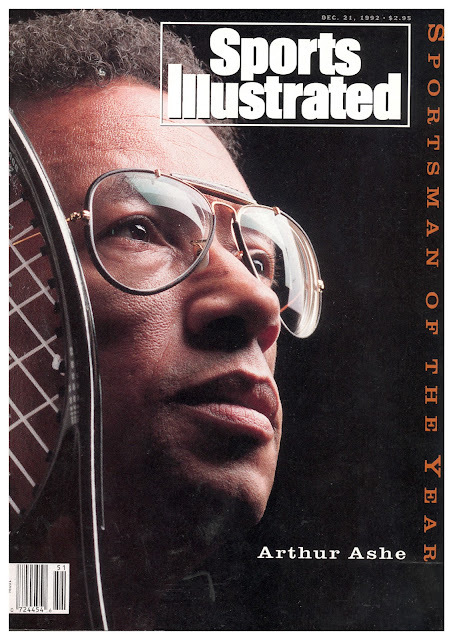 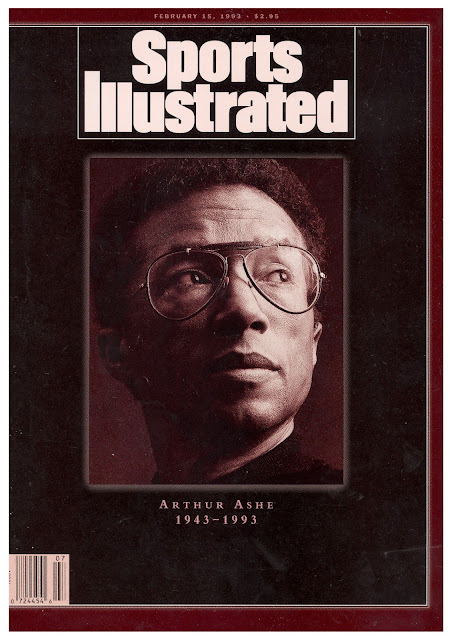 Dec. 21, 1992: Arthur Ashe is named Sportsman of the Year for his "devotion to family and grace under pressure." Feb. 15, 1993: Arthur Ashe (1943-1993) -- He Did All He Could. May 10, 1993: Monica Seles survives a knife attack in Hamburg. 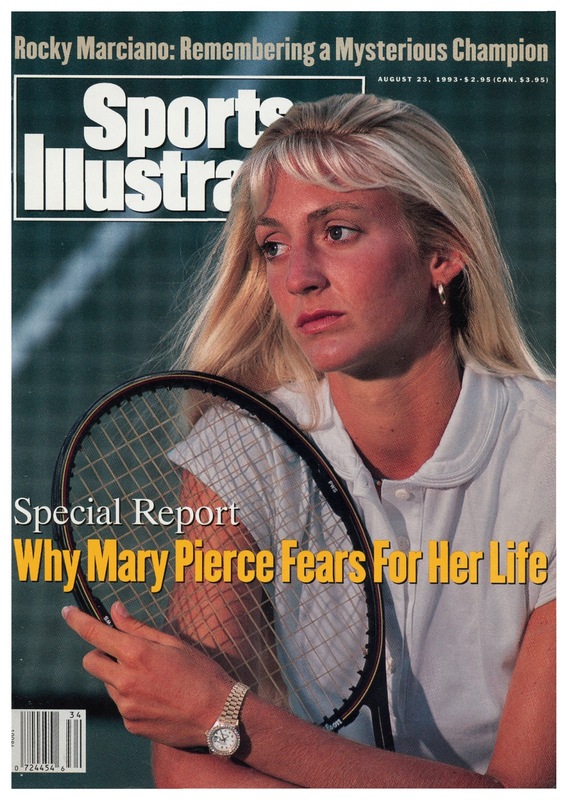 Aug. 23, 1993: Why Mary Pierce Fears for Her Life. 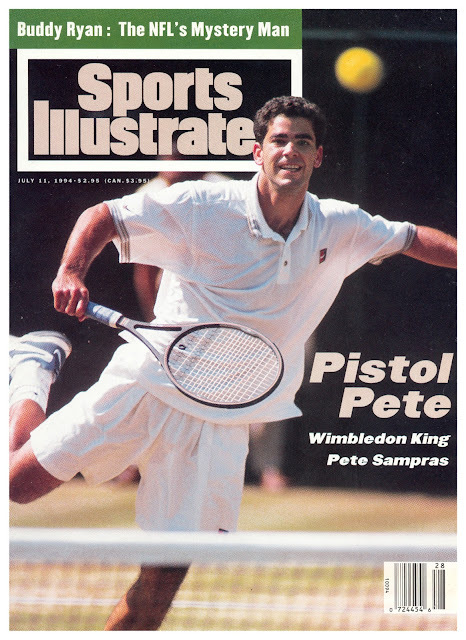 July 11, 1994: Wimbledon King Pete Sampras Wins Again. 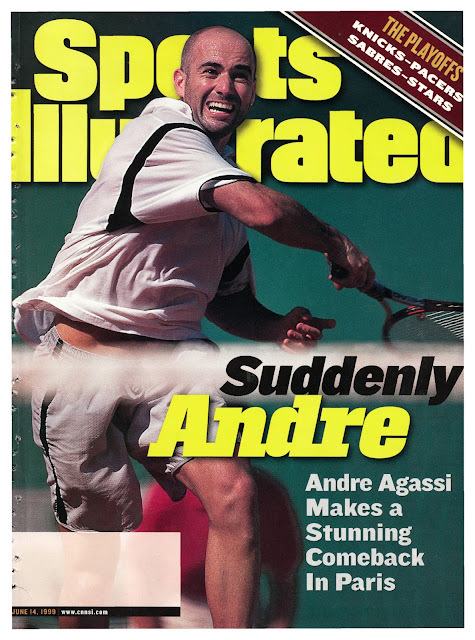 March 13, 1995: The new (bald) Andre Agassi. 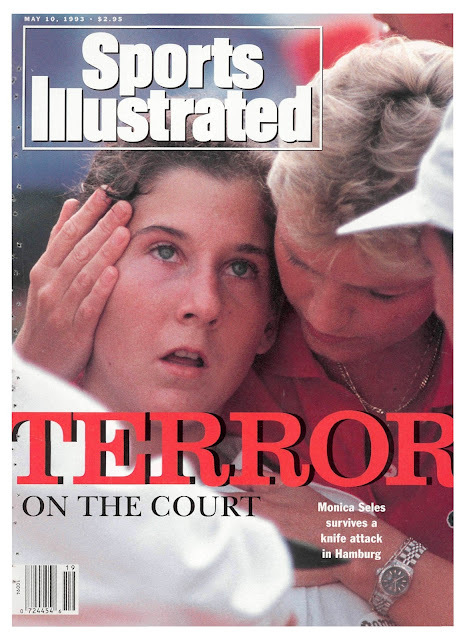 July 17, 1995: Monica Seles -- who I felt very bad for but clearly had other mental issues or else could have come back way sooner -- broke her silence about her harrowing two years away from tennis. 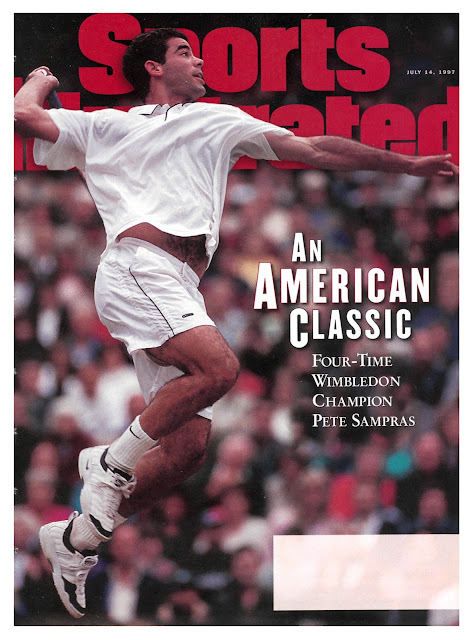 July 14, 1997: Four-time Wimbledon champion Pete Sampras. Sept. 15, 1997: Venus Williams shakes up tennis. 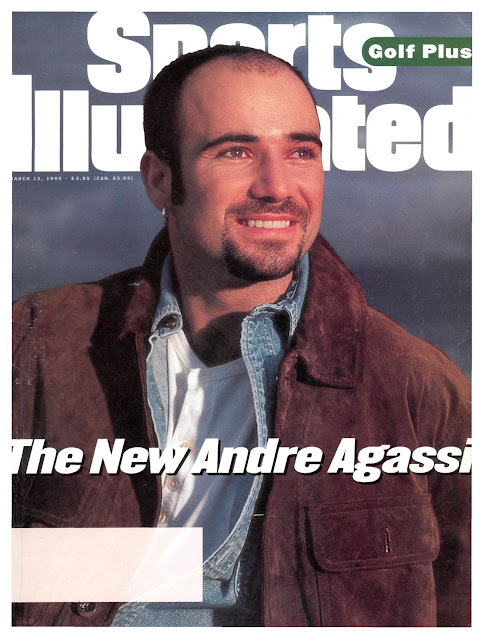 June 14, 1999: Andre Agassi makes a stunning comeback to win the French Open. Sept. 20, 1999: A Williams family surprise -- Serena wins the U.S. Open. 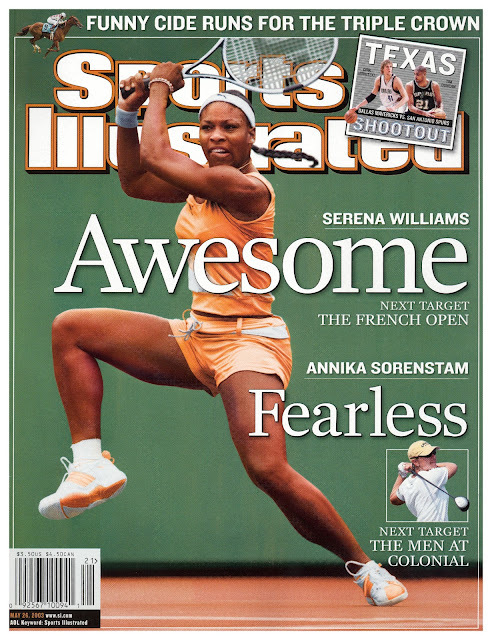 June 5, 2000: Can't imagine why they put Anna Kournikova on the cover. May 26, 2003: The Serena Slam was in full bloom. 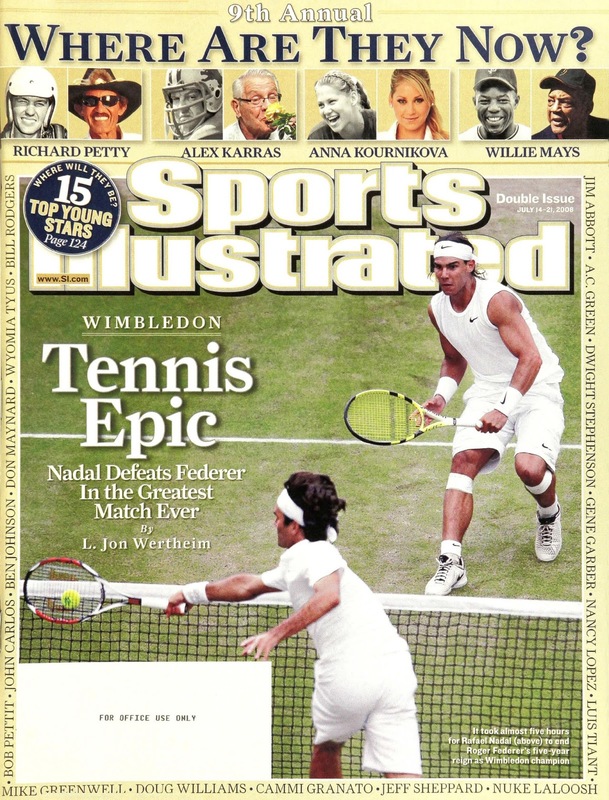 July 12-July 19, 2004: Maria Sharapova Takes Wimbledon at 17. July 14-21, 2008: It took almost five hours for Rafael Nadal to end Roger Federer's five-year reign at Wimbledon. 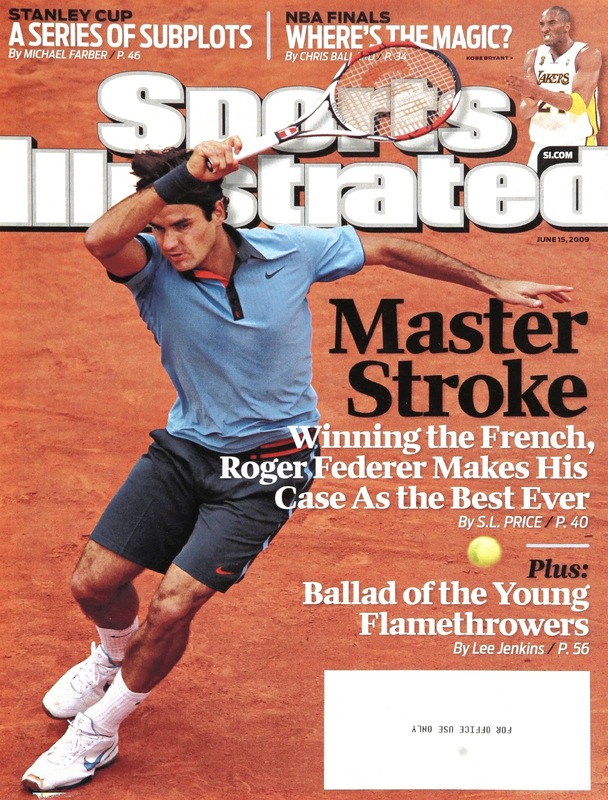 June 15, 2009: Winning the French, Roger Federer makes his case as the best ever. 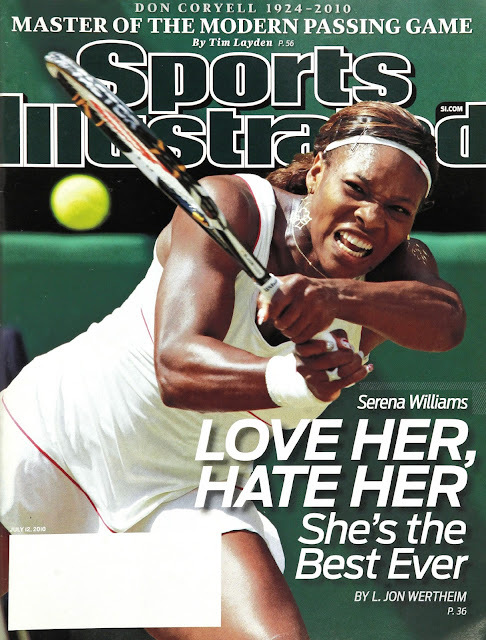 July 12, 2010: Interesting framing -- "Lover her, hate her" -- Serena Williams is the best ever. Aug. 31, 2015: All eyes were on Serena's Grand Slam (that wasn't to be). 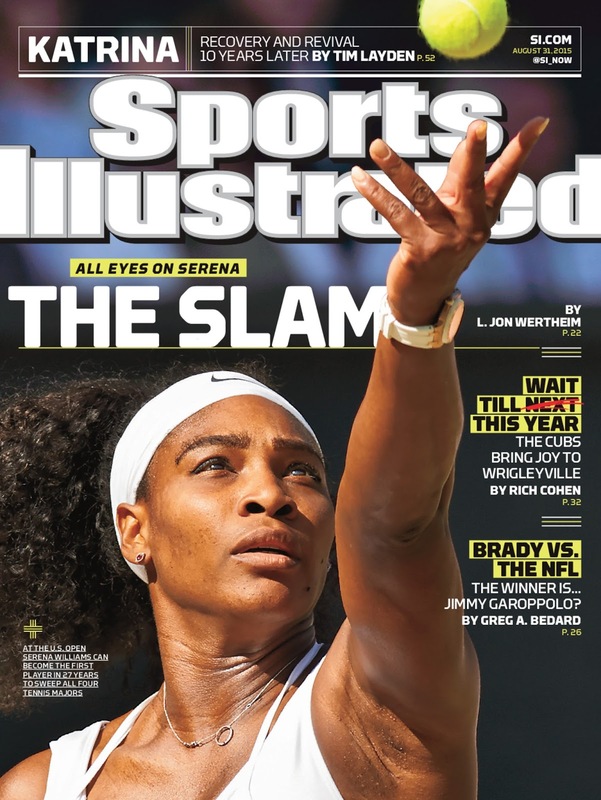 Dec. 21, 2015: Forget sportsmen and sportswomen -- Serena Williams named Sportsperson of the Year. 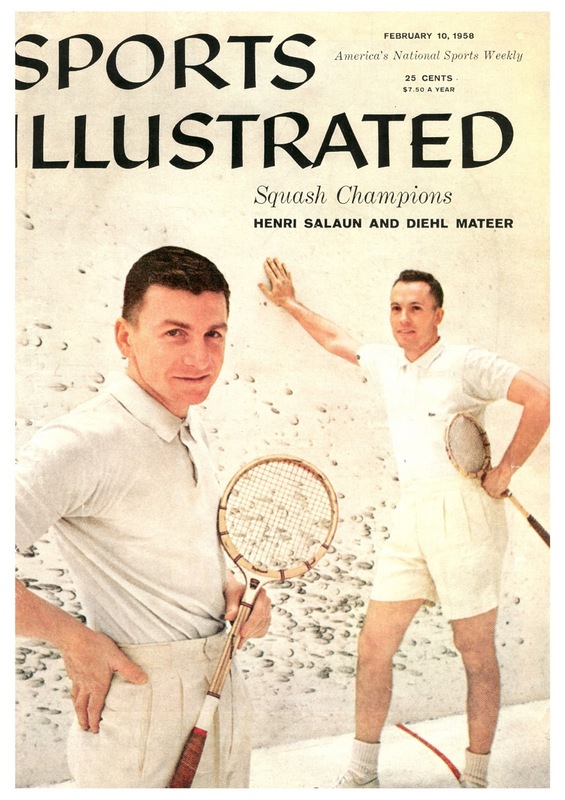 Feb. 10, 1958: I can't even imagine these two on the cover a squash magazine these days! 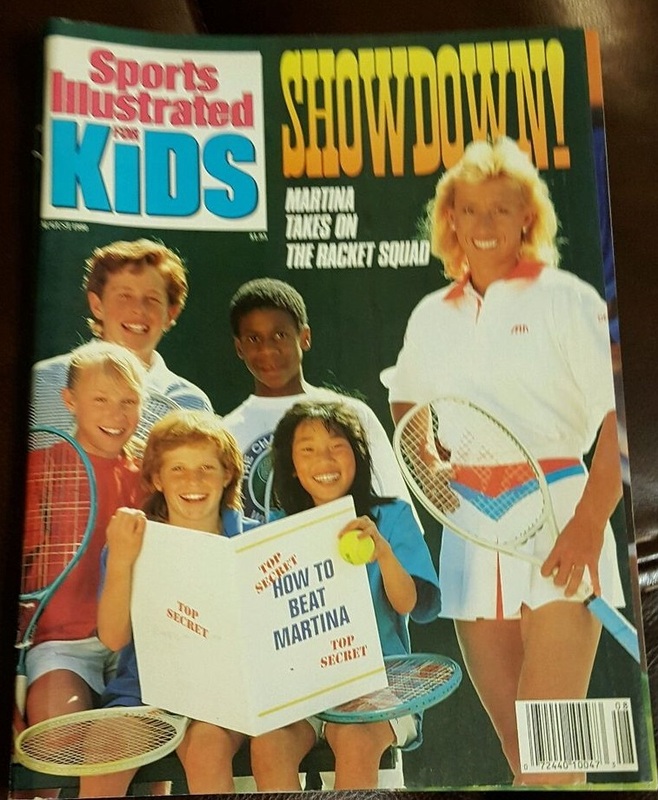 August 1990: The kids edition offers tips on how to beat Martina!